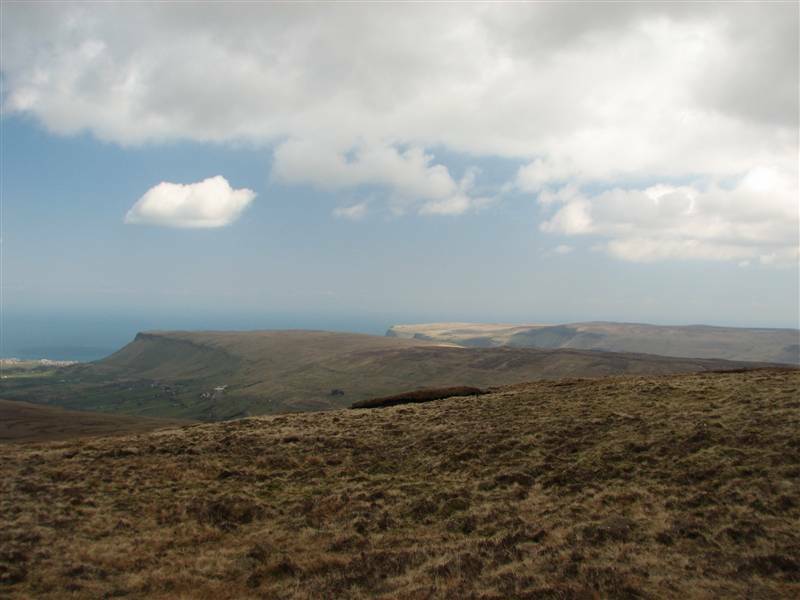 Situated in the heart of the famous Glens of Antrim, Trostan stands at 550 meters and has fine views in all directions. The walk took just under two hours including coffee time, and while boggy in places it is quite easy going. Just a few weeks ago – probably while daydreaming about what hill I’d tackle next – I happened upon some footage of the coast road that runs north from Larne on the BBC’s Coast programme. (This link, unfortunately, will not work outside the UK) It looked spectacular, so when the time came to tackle Antrim’s highest peak I made sure to use the road which provides excellent access to the glens. I wasn’t disappointed. The road winds around and sometimes through rocky headlands, mostly just above sea-level, and frequently with high cliffs rising straight from the margins. The sun made an appearance at the exact moment I first saw the sea upon leaving Larne, and the open windows filled the car with scents of the sea and the beach. It’s the kind of route you drive slowly as you spend so much time admiring the views in the immediate surrounds and towards distant Scotland, so it’s handy that there are stopping points every few minutes. There also seems to be a martello tower like sequence of playgrounds along the way, though on a Wednesday in April there were few people or cars and just a sprinkling of cyclists. The road has been voted in the past as one of the most scenic roads in the world and I certainly wonder how I got through 35 years of life without knowing of its existence. Hello Discover Ireland? In any case, if you are ever in the area you’ll thank yourself for taking in the Antrim Coast Road. While the route continues around the north-eastern corner of Ireland to the Giant’s Causeway and beyond, I took the B14 inland at Cushendall and was soon climbing up into Glenballyeamon, passing the sharp prow of Lurigethan. 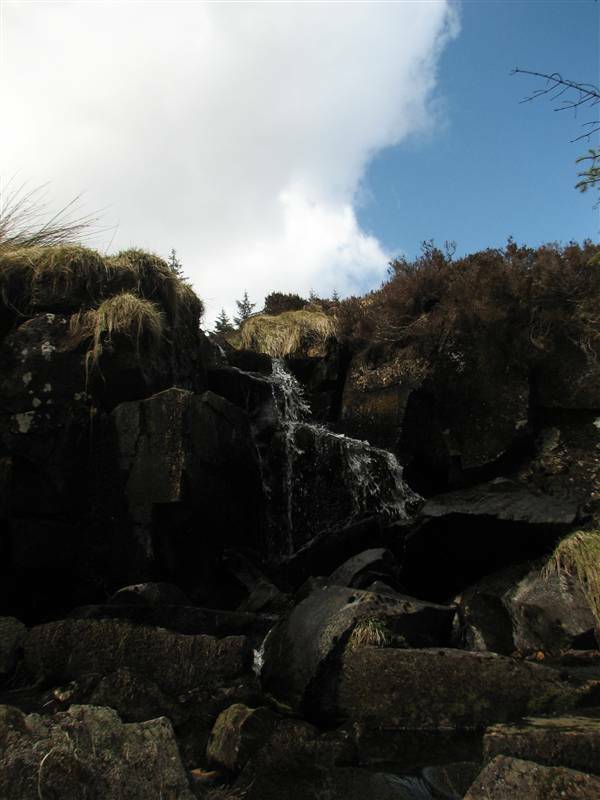 Approximately 5 miles out from Cushendall, the Scottish feeling glen will give way to forestry and you should spot some waymarks for the Moyle Way on your left at Essathohan bridge. If you drive through a kink in the road you’ve gone too far! I parked up at a lay-by with a gate marked Shooting Reserved and availed of the stile that allowed me to walk up the gravel track before joining the Moyle Way. If you’d like to start as you intend to go on, you can walk back over the bridge for about 200 meters and take up the Moyle Way there as it leads you up the edge of the forest alongside a deep gully. From here you follow the Moyle Way along a stream through the trees until reaching a pretty waterfall. Boggy, snow-patchy, dead-sheepy. Trostan has it all. Trostan appears to have a bit of a reputation for being boggy, but I didn’t find it exceptionally so. I was surprised to see patches of snow, a reminder of recent cold weather that hit the north of the country in particular. Three dead sheep I came across, huddled under a peat hag, also indicated how harsh conditions must have been just a few short weeks ago. 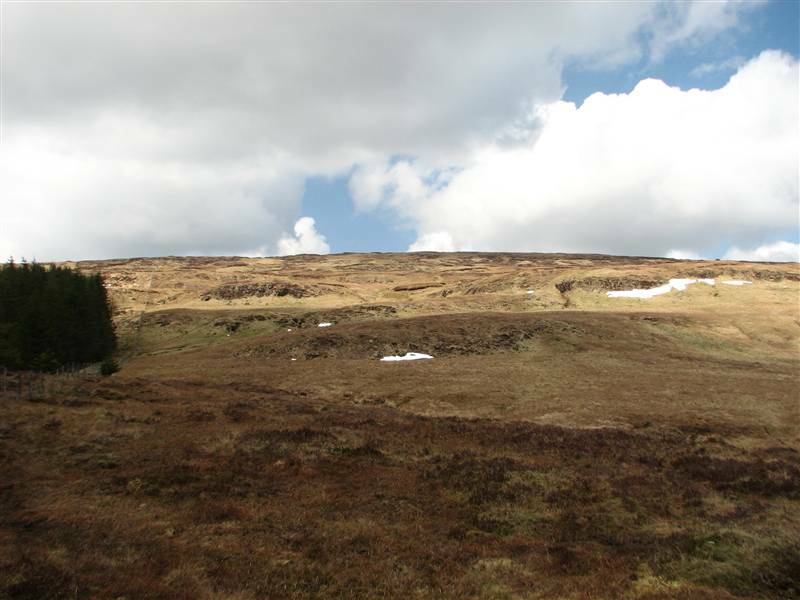 The summit of the mountain could be described as a large flat expanse of sandy coloured cat litter, a contrast to the bog you cross on the way up and down. There are two cairns and a raised trig point marker. The views extend in all directions, particularly if you walk around the summit, and include the cliffs of Rathlin Island and the distinctive Tievebulliagh to the north, the glen leading down to Cushendall, St. Patrick’s favourite R & R spot Slemish to the south and many more. Scotland hangs in the distance, how exciting to be able to see another country! I’d love to visit again on a clear day. Due to my navigational SNAFU I didn’t have time for my planned lunch and walk around in Cushendall, instead heading for home inland through rural Antrim and on down towards the south. It was a pity to make such a flying visit as the area certainly merits a more leisurely exploration. The great thing about this quest is that I’m getting a taste of so many parts of the country I’ve never visited before. The downside is that my visits are short and I don’t always have time to linger. I’ll see you again, Antrim. The area is covered by Google Street View, so you don’t have to take my word for it when I say that the coastal road is worth a visit. Below for example is where I stopped for a picnic breakfast on the coast road, and where I parked before starting my walk. Map: For the walk I followed section 5 of the Moyle Way, covered by WalkNI. You can print a PDF map of the section. The area is covered by OSNI sheet 5. As always, MountainViews.ie is invaluable for route guides and tips. Thank You for your directions Murray, the ones for the route you should take, don’t know what the other route is like as I headed on for Tievebullagh after Trostan. But for February the route you recommended was not too bad! I have read comparision to Moylusha or Culicaigh and I definitely don’t think this is warranted (not from this approach anyway). For anyone looking to make it part of a longer walk I did a circuit from Cushedall. 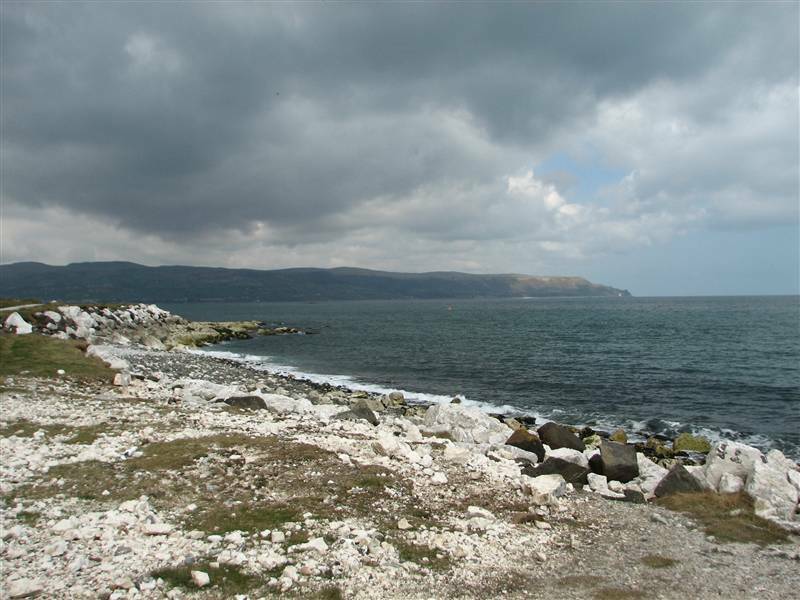 Followed the coast road to Waterfoot, where I followed the Moyle Way up to the waterfall. It is at this point you do need to get on the gaiters and get out the sticks. Apart from it being a county top there is only one other reason to walk it, that is the lunar like surface on the summit which is quite different. There are of course great views. I headed on for Tievebullagh from here, before heading back to Cushedall, a 25k hike in all. Tivebullagh is a mountain with a lot more character and worth checking out. Although be Warned!! There is a dodgy bit of floating bog at the lowest point between the two mountains that made for a nervy 250 metre stretch of the walk! That’s great advice for the longer walk Trailtrekker. Tievebuillagh looks like a fine mountain, I’d like to visit it someday.